There are a variety of orthotic designs for every clinical condition affecting the upper extremity. Before fabrication of any orthosis, therapists must have a clear understanding of the involved anatomy, how the diagnosis affects the anatomy and what the prescribed orthosis can do to alleviate pain and/or assist in the healing process. The patient’s preferences for coloured materials and/or straps, perforated or solid materials, designs and/or decorations should also be taken into consideration. However, this might not even be enough. 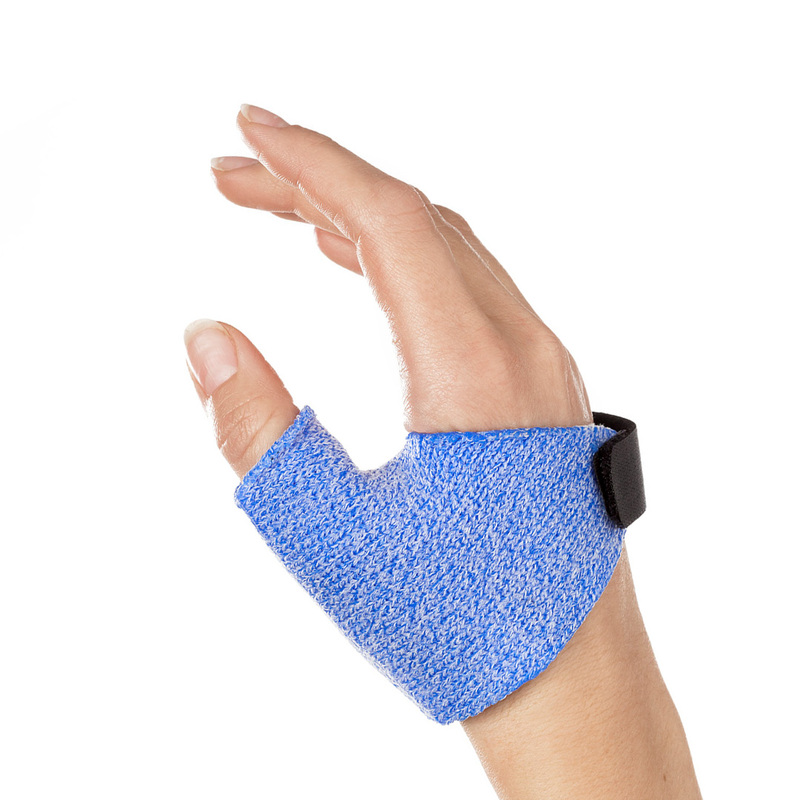 A recent study by researchers in Sweden looked at user perspectives on receiving an orthosis for thumb carpometacarpal (CMC) joint osteoarthritis (OA) to help inform practitioners on additional areas of concern to patients. The study used semi-structured interviews with 16 patients who received both a custom-made and a prefabricated thumb orthosis as a conservative treatment intervention for CMC joint osteoarthritis. Each interviewer asked the participants to tell about their experiences using the different orthoses. Interviewers used different techniques to elicit more detailed responses, including summaries, bracketing or analysis of the answers, and questioning along specific themes such as reasons for wearing or not wearing the orthosis, comfort level, cosmesis, functionality and reduction of pain. This questioning helped to determine the relation of the patients to their orthosis. This relation was defined in the study as the central phenomenon. The orthosis was seen as one of five different central phenomena: stabilizer, tool, healer, preventer and/or nuisance. 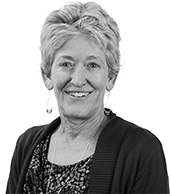 This not only related to their experiences with the orthosis but also to preconceptions about CMC joint OA and their understanding of what the orthosis would or could do for their symptoms. There was a wide variation to the wearing schedules reported by the participants, even though they were all instructed to wear the orthosis specifically during activities. The different wearing schedules reflected the participants’ thoughts regarding the central phenomena: Patients who viewed the orthosis as healer wore their orthosis at rest, while others who viewed the orthosis as a tool wore it during heavy activities. The participants expressed advantages and disadvantages to both the prefabricated orthosis and the custom-made orthosis. The prefabricated orthosis was reviewed as being smaller, allowing greater function, and being more cosmetically pleasing. The custom-made orthosis offered greater support. But participants reported issues with pain reduction, comfort level, colour, irritations and perspiration for both types of orthoses. The ideal orthosis as reported by participants would provide an optimal balance between support and rigidity and suppleness. In summary, the results of this qualitative study suggest that practitioners should ask patients about their understanding and knowledge of their disease process and about the orthosis itself to help correct misconceptions and influence adherence to the appropriate wearing schedule. This might lead to improved outcomes and improved patient satisfaction with the orthotic intervention. 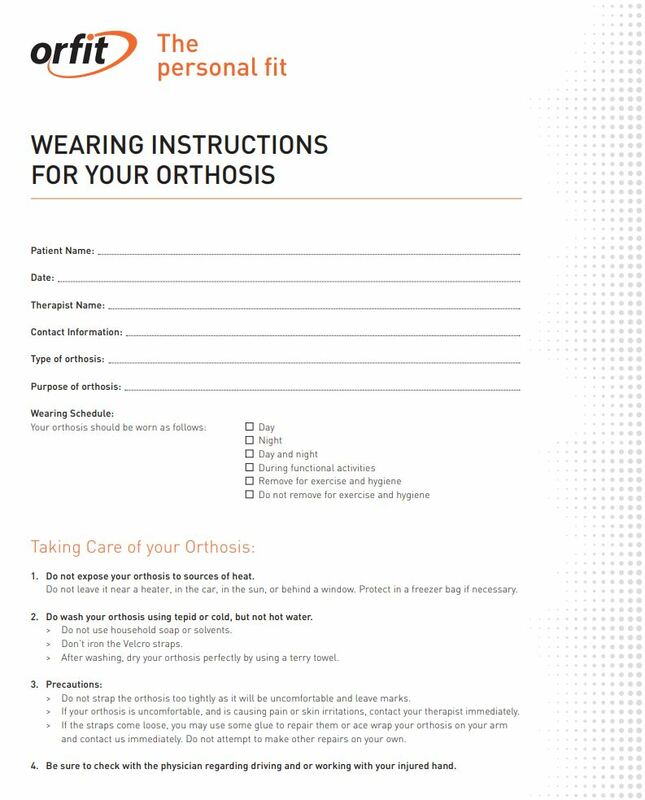 Ask your patient to explain their understanding of why they need the orthosis and what it can do for them if they stick to the wearing schedule as outlined. Correct any misconceptions from the onset. Ask them to keep a log of orthotic wear and reflections on how it is helping relieve symptoms. And perform a simple functional assessment so that you and the patient can see the difference that an orthosis can make with functional activities when you perform a re-evaluation down the road. 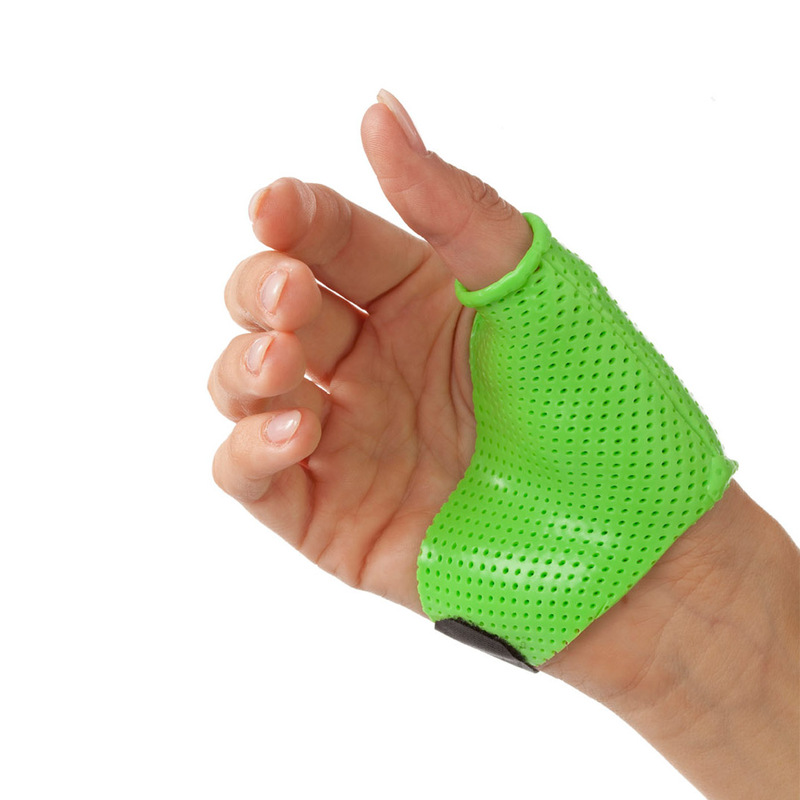 Orfit Industries offers many different thermoplastic materials suitable for patient pleasing thumb orthoses for CMC joint OA. Choose Orfilight, Orfilight Black NS or Orfilight Atomic Blue in 1,6 mm (1/16”) or 2,5 mm 1/12” for a lightweight custom-made orthosis. Choose Orfit Classic or Orfit NS in 1,6 mm (1/16”) or 2,5 mm (1/12”) for increased elasticity and stretch when fabricating the thumb orthosis. Choose Orfit Colors NS in 2.5 mm (1/12”) for a wide selection of bright and bold coloured options. 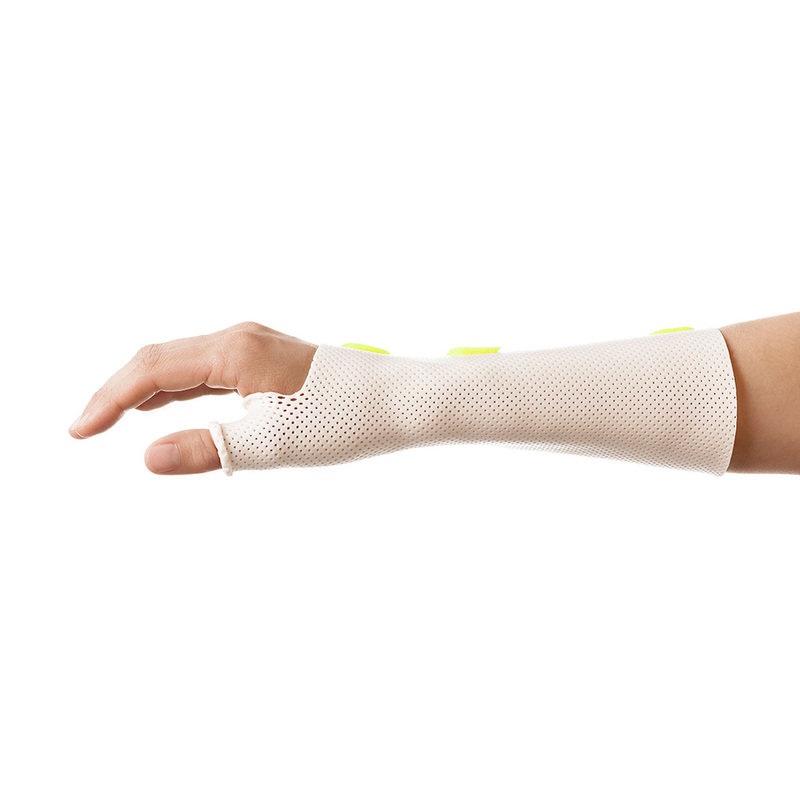 Choose Orficast or Orficast More for lightweight fabric-like support orthoses.